Eggs Benedict is dish that attracts hungry crowds to restaurants for weekend brunch. 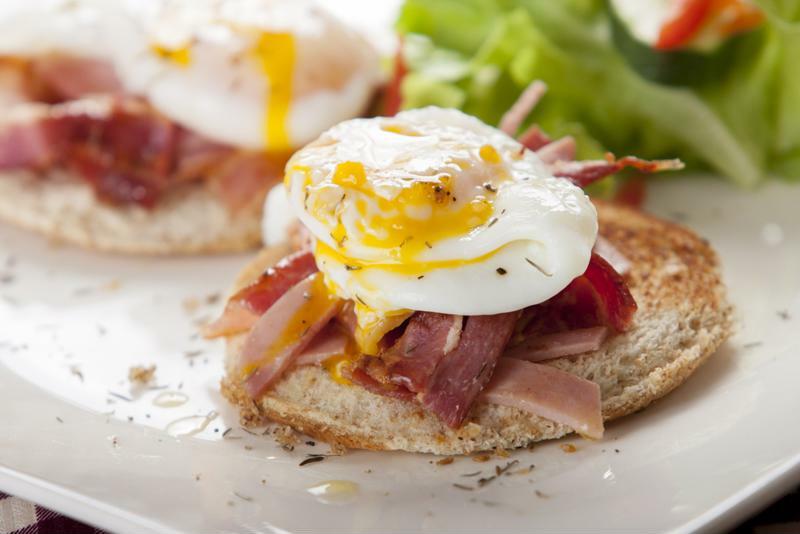 However, you don’t have to leave home to enjoy the comforting combination of poached eggs, hollandaise sauce and ham on an English muffin. By bringing together a few simple recipes, you dig into this classic item without waiting for a table. Hollandaise sauce is a creamy emulsion made from egg and butter, and it may take a few tries to get it just right. To simplify matters, Serious Eats provided a quick recipe that’s ideal for topping eggs Benedict. Begin by pouring an egg yolk into a cup with a teaspoon of water, lemon juice and salt. Use an immersion blender to mix the ingredients as you slowly pour hot, melted butter into the cup. Look for the mixture to combine fully and thicken. Finish the sauce off with a little salt and cayenne pepper and keep it warm. Achieving perfectly poached eggs, with a mostly solid white but soft yolk, can also be tricky. Fortunately, the Pioneer Woman offered some handy advice. This recipe calls for bringing a pot of water to a boil and stirring with a broad, circular motion. Open the eggs into the water and the liquid will continue to turn around them. That movement will hold the whites and yolks together as they cook over the next three minutes. Then, use a slotted spoon to move the eggs into an ice bath and stop the cooking until everything else is ready. Place the eggs back in warm water to heat them up before serving. Once the main ingredients are ready, assembling eggs Benedict is simple. Once you have the eggs and the sauce, the rest of the preparation goes quickly. That is, unless you prefer to make your own yeasty foundation as outlined in Alton Brown’s recipe. Otherwise, just slice a few pieces of Canadian bacon or ham and cook on a medium heat for five minutes, stirring often. Toast an English muffin and spread on butter. Assemble the dish by first adding a little hollandaise to the plate and placing the English muffin on top. Set some of the pork on top of each half of the muffin, followed by the egg. Pour more sauce over the egg. Making a fantastic plate of eggs Benedict takes some practice. However, when you get each step down, guests will be clamoring to try your version of this classic breakfast item.